10 Ways to Botch Your Interview - Need a New Gig? Awesome news! You’ve landed an interview and you are one step closer to getting that new job. Now, you just need to have a successful meeting. 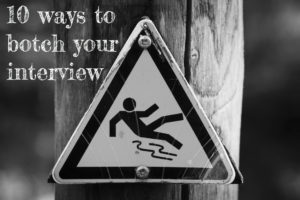 Don’t make these 10 common mistakes and botch your interview! This is one of the most common ways that candidates mess up their interview. In today’s world, it is extremely easy to do research on a company. You should never ask “what does your company do?” during an interview. Spoiler alert – if you do, it will be the quickest interview of your life, and you will NOT be getting the job! I would also suggest trying to do some research on the person that is interviewing you. Take a look at the company website to see if there is an “about us” page, or look them up on LinkedIn. Look for things that you have in common to help connect during an interview. This could be something like – where they went to school, or where thy are originally from. Be prepared to speak about your background and resume. Don’t assume that person that you are meeting with is familiar with your experience. I also recommend printing a few extra copies of your resume to bring with you. This is great in case the interviewer doesn’t have a copy, or they bring in additional folks to meet you. Many would think that this would be a no-brainer, but you would be surprised to see that this happens more often than not. You should focus on being nice to every single person that you interact with, from the second you walk through the door. Wear a smile and keep a positive attitude, whether you are in the waiting room, or with the interviewer. Hiring Managers respect the opinions of their team members, and they will get their thoughts after the interview, even if they just said hello. I used to work for a large organization where the VP wouldn’t hire anyone without the approval of his receptionist. This one is also pretty straight forward, but again it does happen more than you’d think. My take on timing is that you are late if you are not 15 minutes early. This is a good rule of thumb, especially when it comes to interviewing. If it is your first time at the prospective company, make sure you give yourself some extra time. It’s always good to have a buffer in case there is traffic, you get lost, or you can’t initially find where you need to be. If for some reason you get there extra early, hang out in your car until its about 10 minutes before. If you want to be extra prepared, you can always drive out the night before so you know exactly where you are going! Check out our post Too Early For My Interview? to make sure you arrive at the proper time! First impressions are huge when it comes to a job interview, so it is important that you look professional and presentable when you arrive. The dress code will depend on the company and position that you are interviewing for, so you will need to do some research. The big key here is that you don’t want to show up in casual clothes, when you should be in a suit or vice versa. This is one occasion where you are better off over-dressed than under-dressed. Check out our post on What Do I Wear to a Job Interview? for more information on proper interview attire. Do yourself a favor and leave your phone in the car. We are all addicted to our text messages and status updates, but when it comes to interviewing, you don’t need any distractions. A ringing phone during a meeting could cost you the job. As crazy as it sounds, I have had candidates that have been text messaging during an interview! It is very disrespectful, and the Hiring Manager will assume that texting is your priority over doing your job. I suggest leaving it in the car so you don’t even have the temptation to look at it. Let your family and friends know that you will be unavailable, and you can send them a message as soon as you are done. Let’s face it – we all work for a reason, and that reason is to get paid. Compensation is always on our mind, especially when looking for new employment. When it comes to interviewing, it is best to stay away from salary talk until an interviewer or employer brings it up. If you talk salary too soon, it could lead the employer to believe that you are only looking for a better paycheck. My suggestion is to sit tight and wait until they ask. Chances are that you filled out an application when you applied, so the employer is aware of your current compensation and expectations. If they felt that you were outside of their range, they wouldn’t have set up the meeting. Go through the hiring process and let the employer know that you are looking for the right company, position, and culture. If you do this, and it is the right fit, nine times out of ten the money will come with it. This is a big interview killer, yet I still see it all the time. Employers are trying to gauge so many different things during an interview. One of the most important factors is what they call “cultural fit”. Basically, this means that they are trying to get a feel for your personality. They want to see if you will mesh with the other employees at the company. One-word responses may lead them to believe that you are a poor communicator, and can be a red flag. Every question that they ask is to extract information, and find out more about you. This is your time to shine! Know your resume and come prepared. When they ask you a question, have examples ready to go. Be yourself and let your personality show. Everyone wants to be promoted, right? Of course, but you need to be careful how you present that in your interview. If you jump right to asking about promotions, it could make for a short meeting. The interviewer may think that you might be bored in this position, or that you could become unhappy quickly. You have to remember that they are looking for someone who wants to fill their current opening. There is no problem with asking about future advancement potential, and showing that you have interest in growing with the company, just be cautious. Usually towards the middle/end of an interview, the Hiring Manager will ask what questions you have for them. The worst answer to this question is that you don’t have any! Asking questions reiterates your interest in the opportunity, and it shows that you have done thorough research. I suggest making a list of questions to take with you to your interview. Most of these will be answered during your meeting, but it definitely helps in the moment. At the very least, have one or two general questions in mind. Something along the lines of “What can you tell me about the organization’s culture” or “What do you like best about working for this organization” are good examples. Even if you left your last job because you hated your previous boss, this is not the place to air your laundry. This can be a big red flag for potential employers. No matter what the situation was, it’s best left unsaid. Typically, if you bring up negative experiences in an interview, it is not going to help you. My suggestion is to focus on positives. If you had a bad experience, keep it simple and say that it wasn’t the right fit, or that it lacked growth potential. In this situation, less is definitely more. This entry was posted in Uncategorized and tagged ace interview, advice, interview, interview tips, Job Search, mess up interview. Bookmark the permalink. ← How Long Do Employers Look at My Resume?